Computers are amazing technology, but sometimes they’re no smarter than a box of wires. Our computerized catalog is a remarkable database with records for each of the 600,000 items the library owns. You can only find the item you’re searching for, though, if a human has put the right information into the record. That’s the responsibility of Greene County Public Library’s team of catalogers. 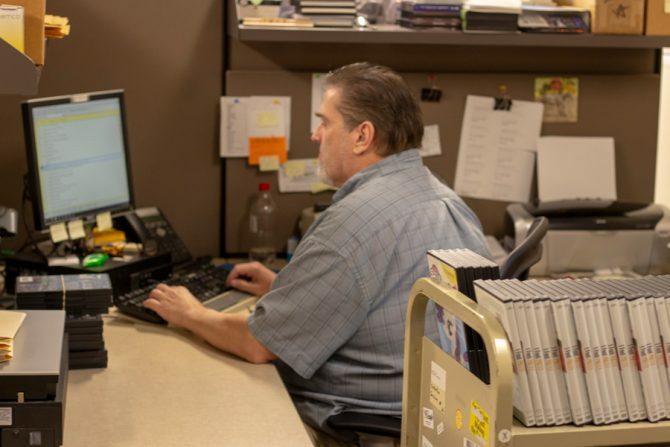 You may never see them, since they work behind-the-scenes rather than at a service desk, but catalogers are the secret engine that keeps the library running. “When I’m cataloging, I’m thinking about all the ways someone might search for an item,” says Tabitha, the library’s former Technical Services Manager and current substitute librarian. The catalog doesn’t automatically know what genre an item belongs to, if a movie is rated PG or R, or whether a book is about buying a home or Sherlock Holmes—until a cataloger adds that information to the item’s record. The cataloging team divides the work by type of material. Jeff and Chris catalog audiovisual materials, while Kelley works on juvenile materials and Marianne handles adult books. The catalogers get the first view of new items that are coming to the library, but also a snapshot of society as a whole. “Whatever’s popular in culture, we get it at the library,” Jeff observes.